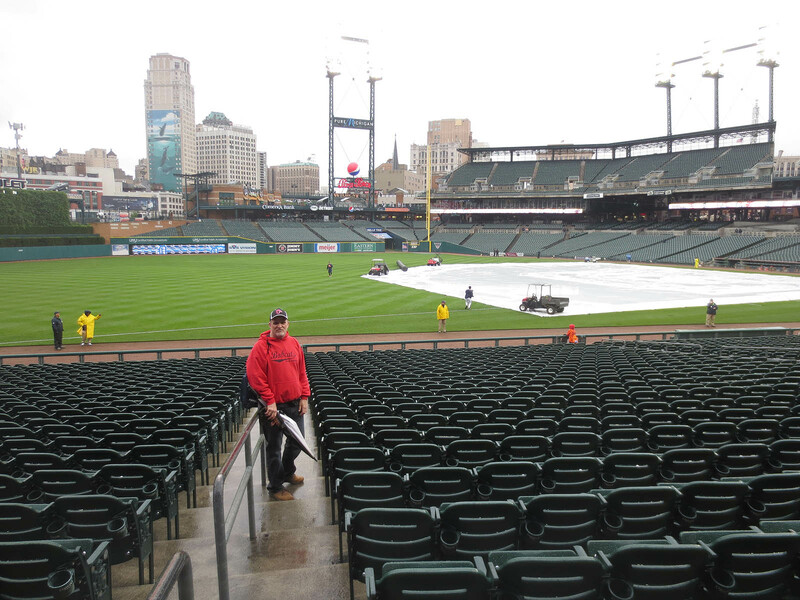 This was my 7th lifetime game at Comerica Park, and for the 4th time, rain wiped out batting practice. What fun. See the guy in the red sweatshirt? That’s a season ticket holder named Dave. See the kid in the orange shirt in the front row? That’s his nine-year-old son David. They live in Michigan, but I met them several years ago at Camden Yards, and we’ve become friends. One of the highlights of this day was getting to see them and catch up. Dave and David know all about my baseball collection, and they wanted to help me keep my streak alive. Therefore, they not only helped me identify the two guys playing catch — Anibal Sanchez and bullpen catcher Jeff Kunkel — but they graciously stepped aside and let me go for the ball. Because I was the only fan asking for it, I ended up getting it from Sanchez. 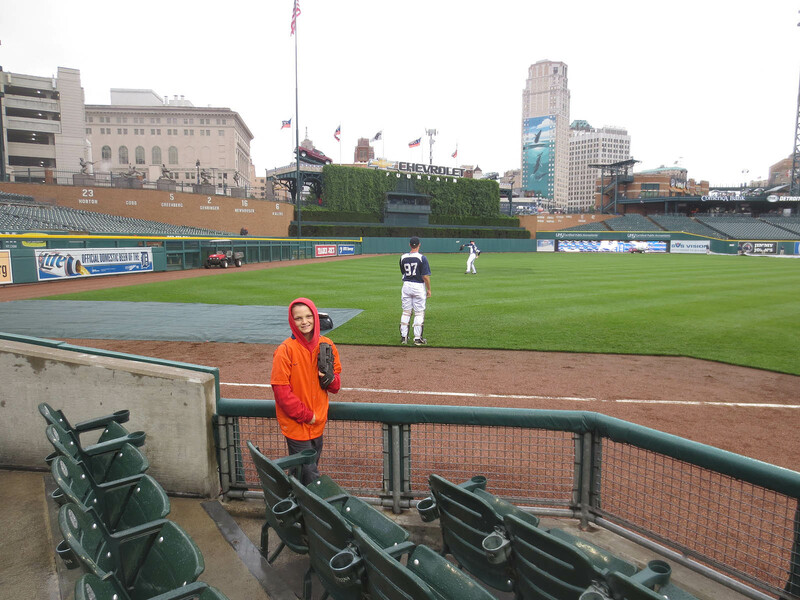 Ten minutes later, when Max Scherzer began warming up in deeper left field, I returned the favor by letting David go for the ball. Here he is waiting for it . . .
After that, there was NO sign of life on the field for the next hour and a half — no players, no groundskeepers, nothing. The game was clearly going to be delayed, if not canceled altogether. I quickly looked at the rosters that I’d printed, learned that the guy’s name was Eduardo Escobar, and got him to toss me a ball by asking for it in Spanish. 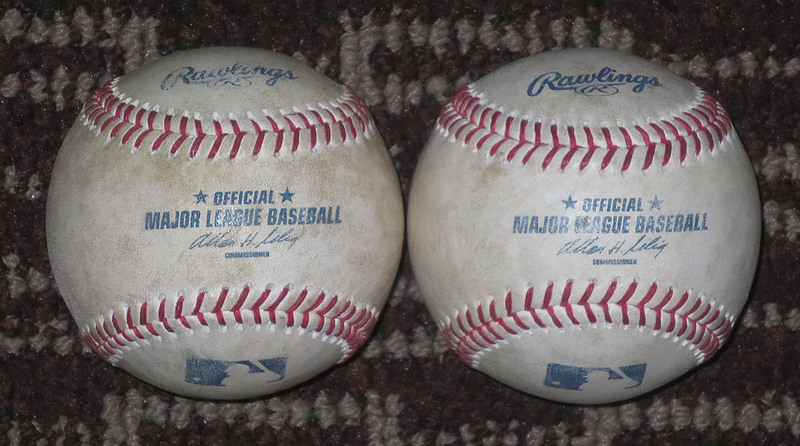 In my previous six games at Comerica, I’d snagged five foul balls. I was convinced that I’d get one at this game, if not two . . . or ten. There was no competition. I was moving freely back and forth through the cross-aisle for lefties and righties. The circumstances were ideal, but as the first inning was winding down, I had nothing. Normally, I would’ve waited until there were two outs to head down there, but because there was a runner on first base, I decided to get a head start in case Miggy hit into a double play. He crushed a two-run homer to left field instead. Prince Fielder followed by popping out to first base. Victor Martinez kept the inning alive with a ground-ball single up the middle, and Jhonny Peralta took a called third strike. Ugh! Twins catcher Joe Mauer ended up with the ball and tossed it into the crowd near the home-plate end of the dugout. Guess who got the 3rd-out ball at the Tigers’ dugout after the top of the 2nd inning? Not me! David managed to work his way down there, and when Aaron Hicks went down swinging, he got hooked up by Tigers catcher Brayan Pena. It was the first game-used ball that he’d ever snagged. Very cool. I was glad to be there to witness it. David and I had our picture taken with our game-used baseballs . . .
Did you notice the shirt that David was wearing? Neal Stewart from BIGS Sunflower Seeds happened to have an extra one, and David was the lucky recipient. (The fact that Dave helped us get free parking and did several other favors might’ve had something to do with it.) I hear that there are still a few extras, so if you’re interested, give BIGS a shout on Twitter. As for my seat in the outfield, this was the view to my left . . . I had all kinds of room to run, but of course there were no home runs hit anywhere near me, and to make matters worse, two foul balls went *right* to the spot where I’d initially been standing for every right-handed batter. I have no doubt that I would’ve caught them both on the fly. In the photo above, that’s Paul on the left. The girl in the white hoodie is his daughter Casey. 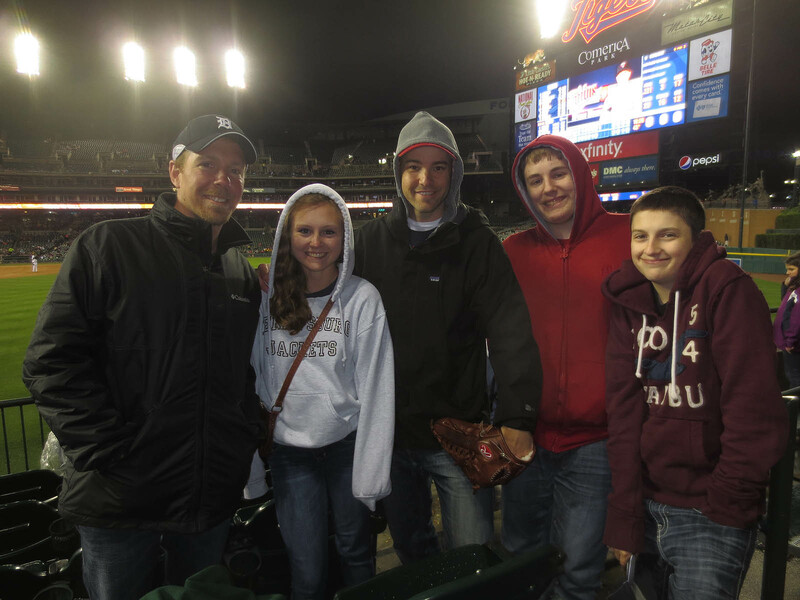 The young man in the red hoodie is his son Tyler, and the kid on the right is Tyler’s friend Sean. Good people. I was glad they said hey but sorry that we didn’t have more time to talk. 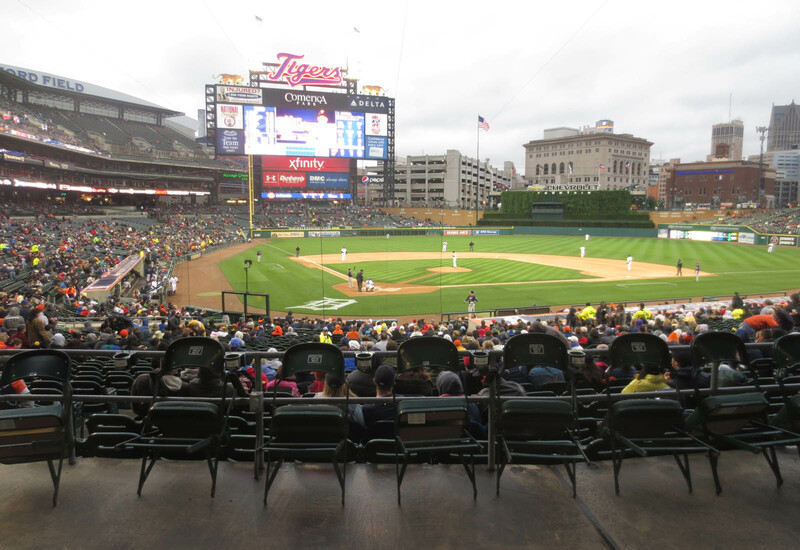 It was so cold in the outfield (with the wind whipping all over the place) that I truly couldn’t take it, so I moved back to the cross-aisle behind home plate. No foul balls. No umpire ball. 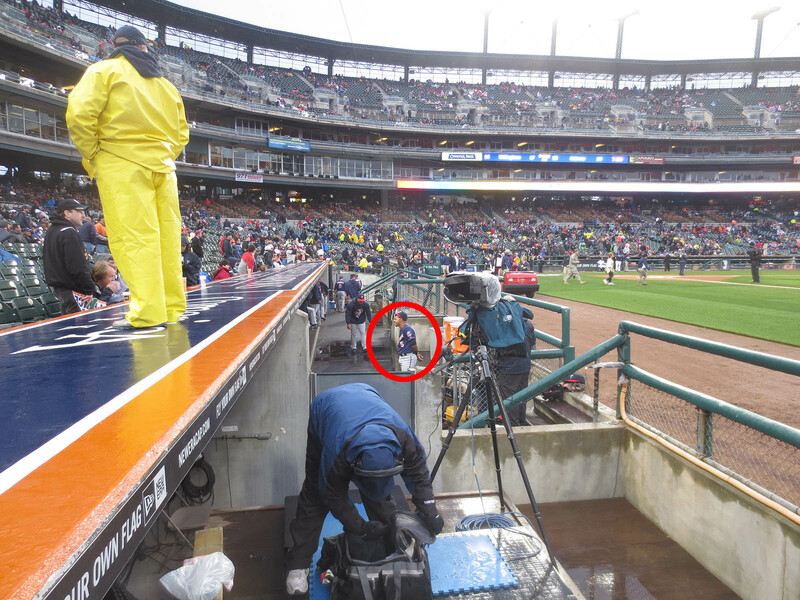 No post-game ball at the Tigers’ dugout. Nothing. Zip. Zilch. Nada. Adios. Good night. See ya later, Detroit. • 235 balls in 31 games this season = 7.58 balls per game. 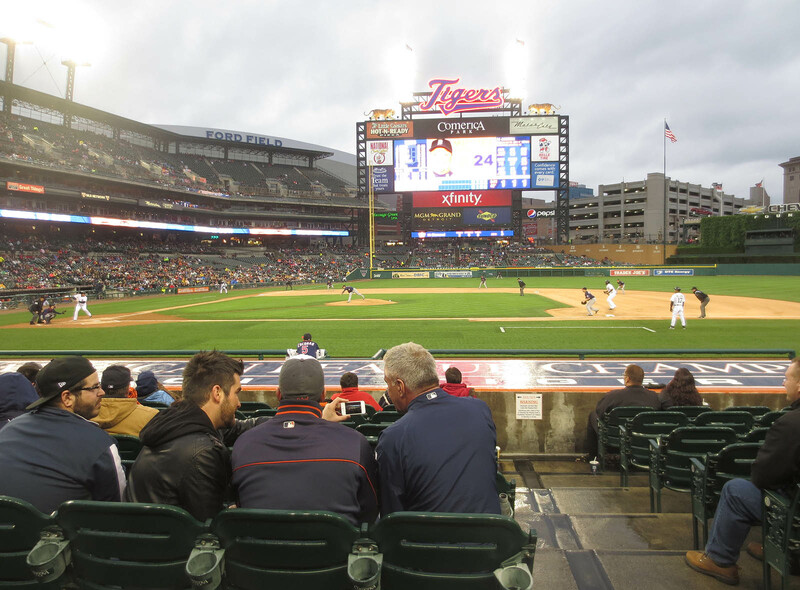 • 40 balls in 7 lifetime games at Comerica Park = 5.7 balls per game. This is one of those stadiums that I’ve been to but need to get back to because it could potentially be a fun place to ballhawk. In this case because of the cross-aisle. I agree with Mateo, it’s a fun place, when it’s not cold and rainy, as it was last time we were there too. It’s also one of the most beautiful stadiums in baseball. But I don’t see myself going back to that city anytime soon. 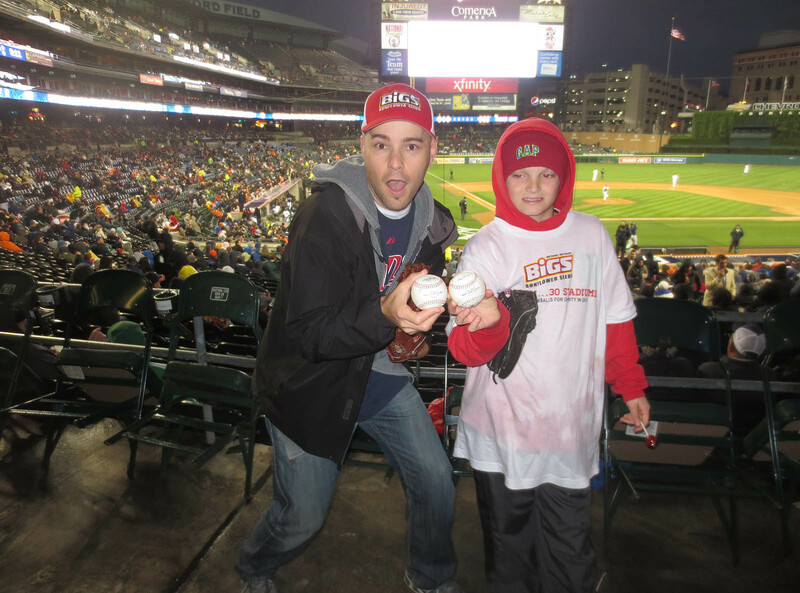 May 28, 2013 - 3:08 am Tommy M.
Quick ‘n’ easy… Show up… Snag a gamer… Earn $500 from Bigs for Pitch In For Baseball…out!! I just put in an order for about 13 bags of Bigs Seeds. Ill be eating them at every game i go to for the rest of the season. I cant wait to try the Old Bay, its gonna be like heaven in my mouth. U wanted Miggybombs.how is subway series goin..go angels 9 in a row…Ttrumbomb inLA was inDevins row! I think the Tigers will win the world series this year! They have the best line-up and a great pitching staff. They have a solid chance to go all they way! I also went to this game. I would love to have met you Zack. And yes, it was cooooold with the wind and rain factor. Wow , beautiful conditions to be watching an outdoor sport. I thought it was supposed to be spring over there. Or is this typical Detroit weather ? 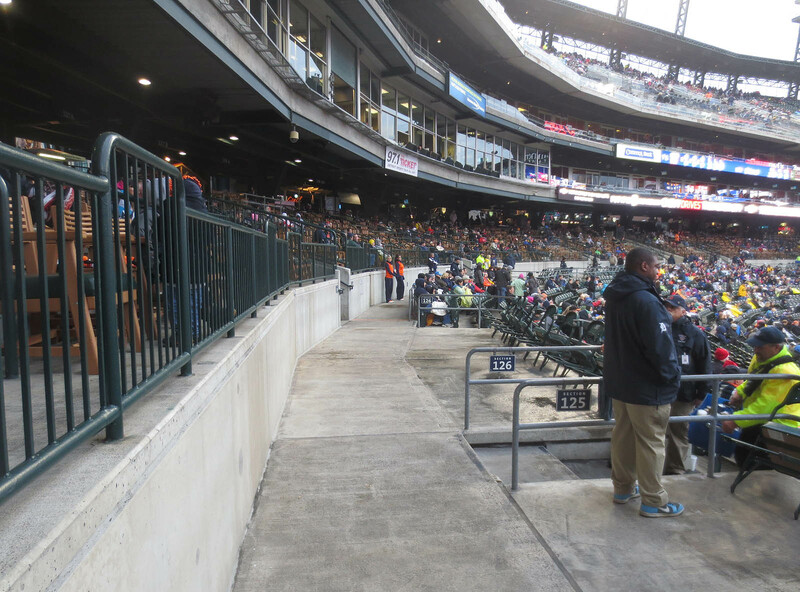 Comerica was absolutely packed on Saturday and Sunday. 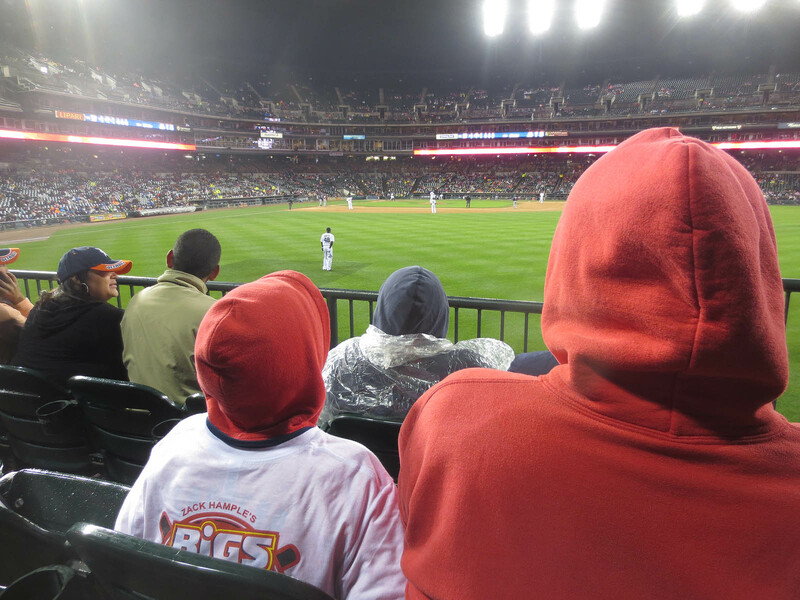 I liked our Comerica weather better than yours, but I prefer your attendance over ours. 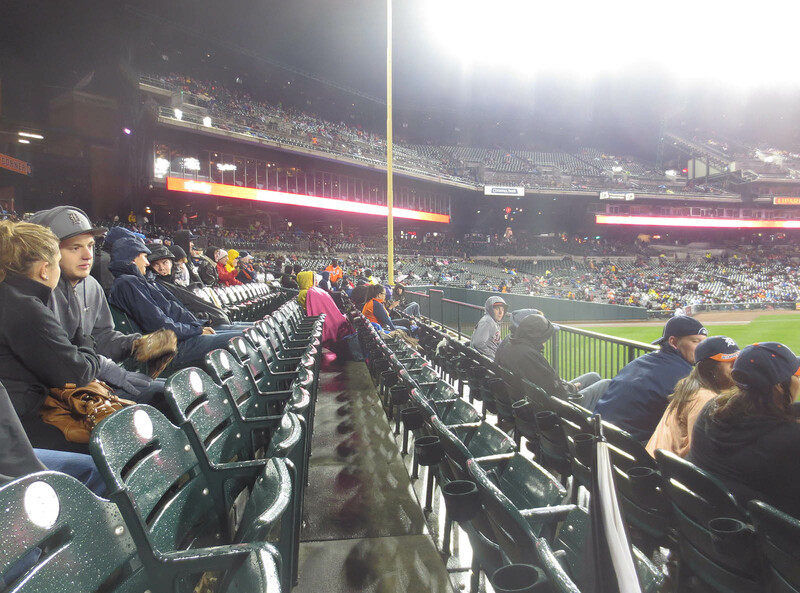 Still, even with a packed house, Comerica is great. The ushers were all very nice. Other fans were nice. No complaints. 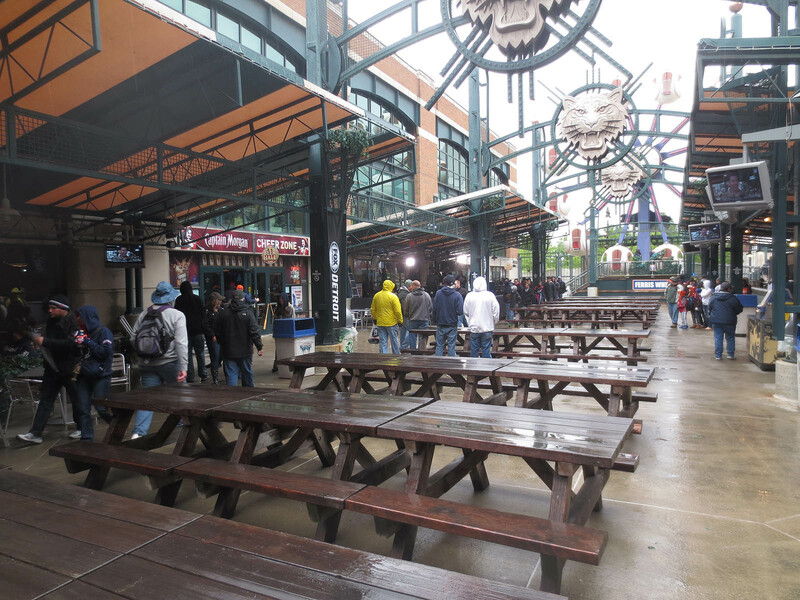 Comerica is fun in some ways and really annoying in others. I think it’s a nice-ish, but highly overrated stadium. One of the most beautiful? Eh, I disagree. 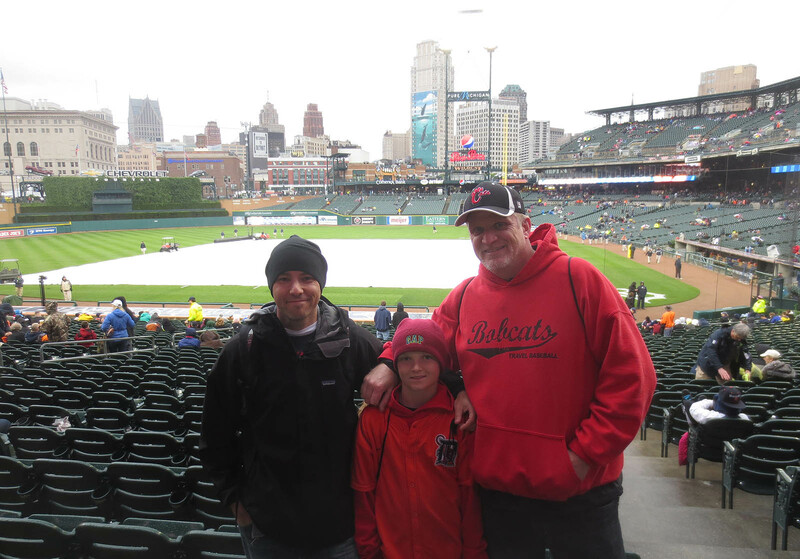 Yeah, it was easy, but this was also probably the most boring/unpleasant day I’ve had in any stadium this season, in terms of the lack of BP, the rain delay, and the freezing weather. Nice! Let me know when you get the Old Bay seeds. I’m eager to hear what you think about them. The Subway Series is going great. I’ve skipped both games so far, and the Yankees have yet to win. Yuck! I think I’ll stick to bringing my own sandwiches, protein bars, and BIGS seeds. I agree that the Tigers are an excellent team. It’ll be fun to see how everything plays out . . .
Oh, man! You didn’t know ahead of time that I was going to be there? Sorry about that. This spring has been awfully cold, but it’s supposed to be about 90 degrees (32.2 Celsius) here in NYC on Friday. I can’t wait! I love hot weather. Are you one of those freaks of nature that doesn’t ever get cold? 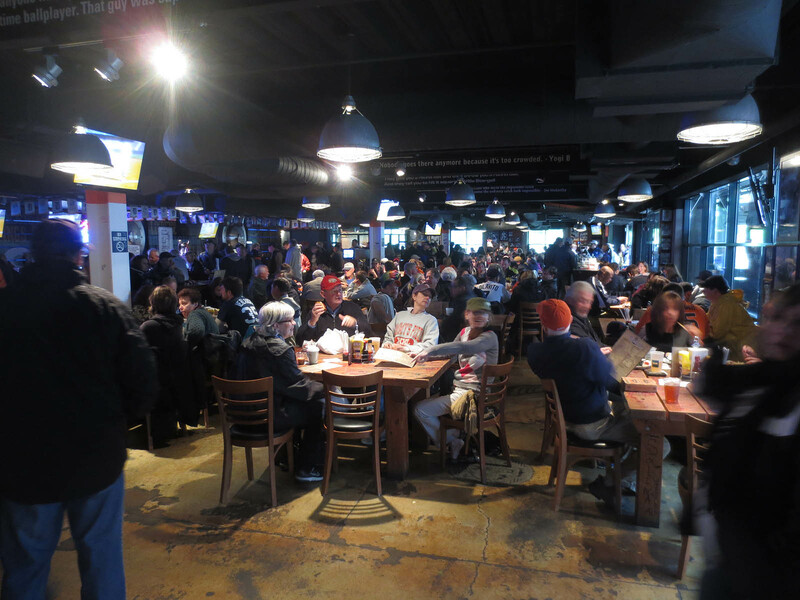 You pick *the* most crowded games, and by the way, yes, I know I owe you some photos. You shall have them soon. I’m really far behind on everything. Zack, do you have a schedule posted of your upcoming trips? In a way, that’s kind of bad…. stalker wise. Hahaha. So far, I haven’t had any problems; it seems that the people who stalk me just want to talk about baseball, and I can live with that. As for my schedule, check out bigsbaseballadventure.com and click “The Adventure” link. Some of my dates/games might change, so keep an eye on it and don’t plan anything TOO far in advance. Oh, jeez. You guys were the highlight of my day — the one thing that kept me sane. I even enjoyed it when David was trying to step on my shoes. I love the displays of tigers all over the place. I find it gorgeous. I would take Comerica over most. You’re right. Comerica is pretty amazing. The tigers in the ballpark are awesome. The people who designed the park did an amazing job. I’m shaking my head in disbelief. Just because there’s a ferris wheel for your kids doesn’t make it a good park. Detroit’s weather is always garbage. 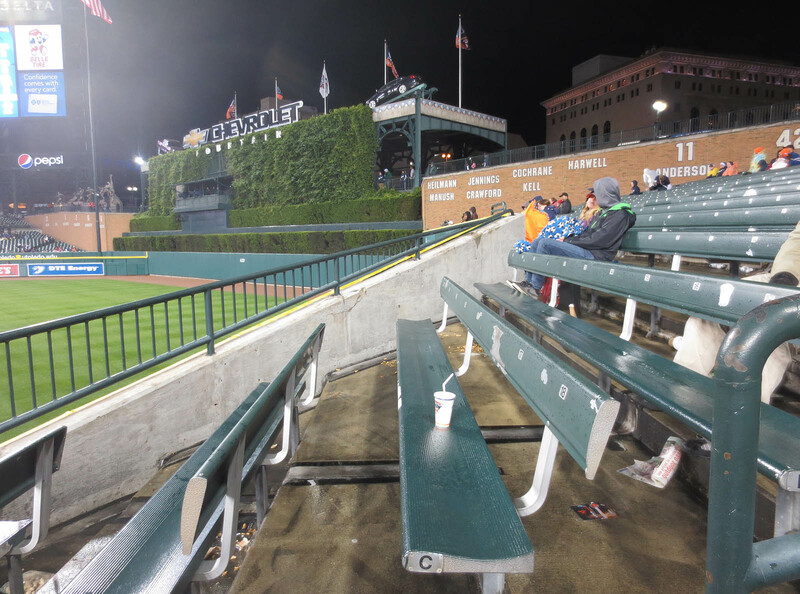 Comerica Park has such a deep outfield, I would also have to say that this is one of the worst ballparks for ballhawking. My favorite hidden feature of the ballpark was probably the dark tunnel in straightaway center.